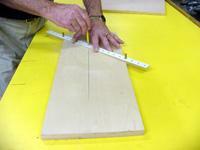 The adjustable locating pins on this centering jig quickly locates center on any board. The locating pins are moved closed to the center for narrow boards and farther apart for wider stock. This jig is made from 1" wide x 1/4" thick MDF board and consists of a center hole and equally spaced 3/16" diameter holes for the locating pins. 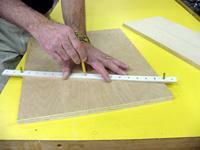 Use a 3/16" diameter bit in the drill press and center the holes 1" apart down the center of the 1" wide MDF board. We used our safety guide pin which has a 3/16" diameter end in the appropriate holes for the board you are using and mark the center!